For every person who flosses, there are ten who say "I don't floss as much as I should." More specifically I hear, "you will never get me to floss" and "I hate flossing." 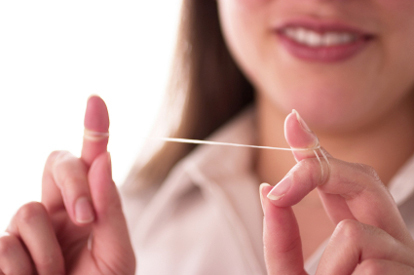 Why do dental professionals always want our patients to floss? If you followed a dentist around for a half a day, you'd learn why. My day is filled with fillings (pun intended) between teeth. When I do an exam for a patient getting their teeth cleaned, I view their recent decay-detecting films (called bitewings). Then I go into a room and do a quadrant (four teeth) of tooth-colored restorations (called composite resin fillings). I may next do a root canal and crown prep for someone who had a really big area of decay between their teeth. I'd be really bored if there were no cavities between teeth. But that doesn't motivate most people to floss because they already know they should, they just really hate flossing. The good news, is that there is another option (no I'm not thinking dentures)! It's called a Waterpik. That is a brand name of a device that cleans between teeth with water pulsing. The research tells us it is as good or better than flossing. So, no more cutting off the circulation of your fingers. No more getting floss picks to shred while going between your teeth. No more trying to get your fingers to the back of your mouth. Honestly, I am one of the strange people who likes to floss, and I bet that didn't surprise you. I just started using a Waterpik this year, even though I knew the research has been strong for decades. Surprisingly, I like it more than flossing. There, I said it. I never thought something could take my floss' place. It feels good! I have used my electric toothbrush for two minutes, floss (like an expert), and then just to see if I got everything out, I used the Waterpik. Gross is all I can say about what I saw in the sink when I used it. Try it out and see if your next dental exam with Life Smiles family dentistry in Plymouth, MN, and cleaning brings you rave reviews! How does a Plymouth, MN dentist evaluate for TMJ?